You know that can of chickpeas hiding in the back of your cupboard? Fetch it out and transform them into this delicious, savoury snack. Straight out of the oven they are crunchy and crispy. Once stored, they soften back up again, but follow my notes in the recipe section if you want your chickpeas to stay crispy for longer. Serve them sprinkled over salads or soups, or eat them by the handful as a moreish snack. Chickpeas make a great high fibre, high protein snack in your kids’ lunchboxes which they’ll just love munching on. Preheat oven to 175 degrees. Prepare a rimmed baking sheet with parchment paper. Dry chickpeas in a tea towel REALLY WELL. Remove any skins which have come loose. Leave the chickpeas to air dry for a few minutes. Place chickpeas in a medium bowl. Stir through olive oil to coat the chickpeas..
Pour chickpeas onto the prepared baking tray. Roast for 25-30 or until golden and crispy. I like to stir them half way through. Remove from oven and toss with spices and salt while still warm. Allow to cool. Store in container for up to 3 days. 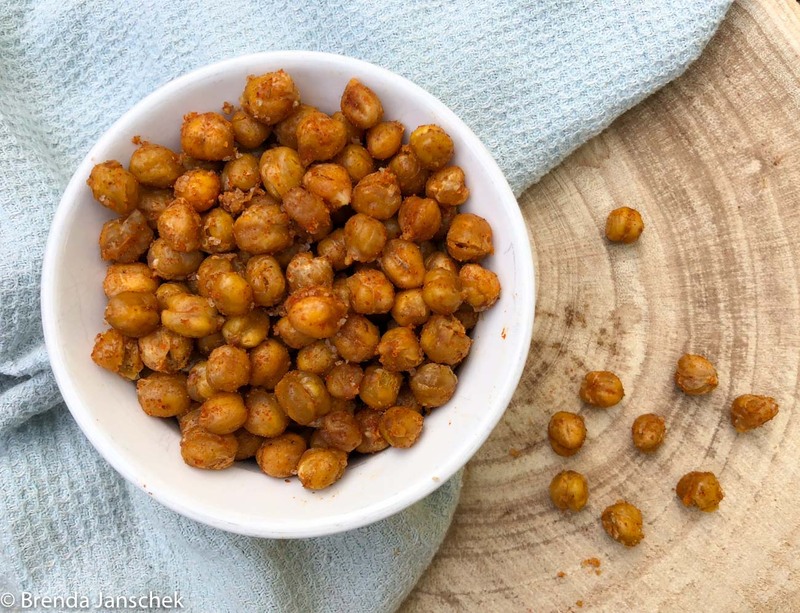 If you want your chickpeas to stay crispier for longer, switch off the oven and leave the chickpeas in there to dehydrate until the oven is completely cool. Even leave overnight. If you make my recipes please take photos and send them to me, or if you share them on instagram, remember to tag me @brendajanschek or #brendajanschek, I’d love to see what you make! Here are a couple of other easy savoury snack recipes you might like – Auntie Helen’s Hummus or my Taco Popcorn.